Tempting as it is to simply write a polemic praising Lincoln as the greatest statesman of, well any generation, I have tried to restrain myself, as writing a polemic is, of course, not the point of a book review, or so the Deputy Editor advises me! Instead of simply summarising an outstanding book, I have tried to briefly highlight Lincoln’s exceptional political skills and how he used them to win the Republican nomination for the Presidency, unite the North in the Civil War and forever end the notion in the United States that it was OK for one human being to own another.. It is easy to think sometimes that spin, media management, public opinion, ‘modern campaigning techniques’ et al were all invented in 1997, or at a push, perhaps during JFK’s election campaign in 1960. Not so. Lincoln’s sheer political acumen, his ability to understand and empathise with both his political friends and rivals, his innate grasp of where public opinion was, his sense of timing, his ability to hold a disparate coalition together, his political bravery, his determination to overcome the electoral defeats which littered his pre-Presidential career, his dogged, Churchillian optimism that the Union would endure, and above all, his piercing moral clarity all shine through this book. He was known by his electorate without irony as ‘Honest Abe’ – ‘Honest Tony’ or even ‘Honest Gordon’ does not quite ring as true. If David Cameron becomes ‘Honest Dave’ during the next three years, then he is guaranteed the keys to Downing Street. Doris Kearns Goodwin’s book is the best political biography I have ever read – I got through 750 pages in seven days which is sprinting pace for me. She combines the novelist’s skill of making the reader want to turn over one last page to find out what happens next, with concise explanations of one the most fascinating periods in the US’s history, and one of the most fascinating men ever to have lived. 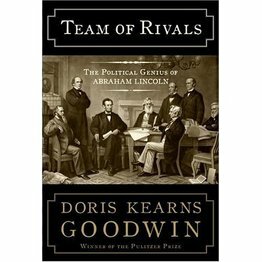 Kearns bases her book around not just Lincoln, but also around the three men who were his rivals for the Republican Presidential nomination in 1860; William Seward, a Senator and former Governor of New York, who became his Secretary of State, Salmon Chase, a Senator and former Governor of Ohio, who became his Treasury Secretary, and Edward Bates, a Judge and former Congressman from Missouri who became his Attorney General. They all considered themselves worthier candidates for the Presidency than Lincoln, they all had much more experience than him and even having accepted his offer of cabinet posts, they all treated him with varying degrees of contempt. Yet, he appointed them to his cabinet because they were the best men available (for West Wing fans out there, Aaron Sorkin does get a little help with his scripts from history!). It shows impressive confidence for a Leader in any job to appoint to, and retain in, hugely influential positions people who were once, and may have been again in the future, his rivals. Lincoln out-manoeuvred them all, quickly earning their respect, and managing the petty squabbles they had with each other. He did not take offence when offence was the obvious option, but instead soothed egos, acted with humility and made sure that all the talented men at his disposal worked for him whilst he considered them useful. In his crude plotting against, and almost total disloyalty to, his President, Chase, driven by an intense desire for the Presidency that makes Gordon Brown appear unambitious and selfless in comparison, behaved in a way that was tantamount to treason in his quest for the Republican nomination for the Presidency in 1864, a nomination, which of course Lincoln won easily. However, Lincoln recognised that Chase was working wonders in the Treasury, raising the money needed to fight the war, and thus Lincoln kept him on until he had served his, and his country’s purpose. Despite every provocation imaginable, Lincoln later appointed Chase as the Chief Justice of the Supreme Court. Lincoln’s career until his election as President was unimpressive - four terms in the Illinois State Assembly, one term in the US Congress and two failed campaigns to be elected a US Senator for Illinois were the sum total of his achievements up until 1860. Yet, he outplayed men with far greater reputations, far more resources and much more fame to win his Party’s nomination. He did this by taking charge of his own campaign to a much greater extent than his rivals did. He spent the year before the Republican convention touring the country, making speeches wherever he could. He made sure the convention was held in Chicago, in his home state. He made efforts to cultivate journalists. He managed his state party skilfully. He did not change his moderate position on slavery to try and increase his support – he understood that winning any election is about building coalitions. Partly because he was relatively unknown, and partly because of his own personality, Lincoln had not made enemies, indeed, throughout his career, he made a point of converting former rivals into allies. Unlike his three rivals, he had not given people a reason not to nominate him. Seward was handicapped by being too radical on slavery, Bates by being too conservative, Chase by his poor inter-personal skills and a failure to run a proper campaign. Maybe a member of David Cameron’s team read this book before the leadership election? Throughout his career, Lincoln had an uncanny ability to express complicated issues in simple terms. In his speech on accepting the Republican nomination to the Senate for Illinois in 1858, he compared the US, with its “free” and “slave” states, to a house, saying, “a house divided against itself cannot stand…it will become all one thing, or all another”, explaining, in language that ordinary people could understand, whythe issue of slavery had to be resolved. In his most famous speech, The Gettysburg Address, he condensed the Union’s cause for fighting the war into three paragraphs. Political campaigners today could learn much from Lincoln’s ability to express ideas in simple language. Issues such as tax relief, school vouchers, zero tolerance policing all sound great in theory, but have we really found a way to express these concepts in an easily understandable form? He also was able to spell out clearly where he and his opponents differed. During the Illinois Senate debates with Stephen Douglas in 1858, he said, “the difference between the Republican and Democratic parties….is that the former consider slavery a moral, social and political wrong, and that the latter do not.” Opinion polls consistently show that the public think that there is no difference between ourselves and the Labour Party. I think there are huge differences, but we are clearly failing to communicate these to the public effectively. Lincoln never passed the buck for the defeats the union suffered during the Civil War and showed great loyalty to his staff and Generals. With his Secretary of War, Edwin Stanton under huge pressure after the Union defeat in the Peninsula Campaign in Virginia, Lincoln made a speech in front of thousands on the steps of the Capitol in which he defended Stanton and took the blame upon himself for decisions made during the campaign. After General Ulysses Grant had taken the Confederate fort at Vicksburg after a six week siege, Lincoln wrote to him, explaining that at the beginning of the siege, he had felt Grant’s tactics had been wrong. He finished the letter, “I now wish to make the personal acknowledgement that you were right and I was wrong.” Lincoln’s willingness to shoulder responsibility for setbacks, and laud others for successes earned him the love and loyalty of his colleagues and his soldiers. Slavery, though always a polarising issue since the birth of the United States, between abolitionists in the north and the slave-owners in the south, came to a head in the 1850s because of the extension of the United States westward and southward. Whether these new states such as Kansas, Nebraska, California, and New Mexico would be ‘free’ or slaveholding would affect the balance of power between the north and south and thus the future of slavery in the country. The Republican Party was founded in the 1850s (Lincoln was its first President) to fight the expansion of slavery into the new states. Indeed, this was Lincoln’s position on slavery on assuming the Presidency - although he accepted that the Constitution gave the South the right to hold slaves, he refused to countenance the extension of slavery into these new territories applying for statehood. When the southern states seceded, and fired the first shots of the Civil War by taking a Federal Fort in South Carolina, the northern states under Lincoln, fought the war on the basis of preserving the Union, of proving that democratic governments could not be held hostage by the views of a minority. During the war, Lincoln had to steer a path between the two wings of his party. The radicals in his party wanted the northern states to use the war as a means to end slavery, the conservatives in his party wanted to restore the Union and had no desire to fight a war to end slavery. The Union war effort was in almost constant danger of being ripped apart by these competing aims, and Lincoln showed great skill in keeping his side together, never more so than in the aftermath of the Union’s defeat at Fredericksburg. Radical Republican Senators, who feared that the war would end with the Union restored with slavery intact, searched for a scapegoat, and identified one in Seward, who it was claimed was preventing Lincoln from fighting the war as aggressively as they felt he should, and called for Lincoln to remove him from the cabinet. Lincoln agreed to meet with the Senators and treated them with civility. After Lincoln and other members of the cabinet defended Seward, he Senators reversed their call for Seward to be removed, and Lincoln succeeded in retaining his Executive authority and prevented a split in his party at a crucial point in the war. Not only did Lincoln have to manage the differing slavery factions within his party, he had to manage public opinion. He understood that he could only go as far as public opinion would allow him, particularly as elections were held as normal in the northern states throughout the war. Had he sought to abolish slavery too quickly, support in the Union for the war effort would have haemorrhaged. Eventually, public opinion in the north on abolishing slavery was sustained by the realization that slaves formed a hugely important part of the Confederate war effort. Using black troops from the north, and allowing escaped slaves to fight for the Union could play a part in winning the war and indeed, black soldiers fought with huge distinction on the Union side. Using war powers granted to the President to override the Constitutional protection afforded to slavery, Lincoln issued the Emancipation Proclamation on New Year’s Day 1863. Congress confirmed the ending of slavery for ever in the US by passing The 13th Amendment, abolishing slavery, at the beginning of 1865. Sometimes in comparison with the great debates of the past, politics today can seem a little trivial. Arguing about whether the government should take steps to reduce obesity, or exactly how long “a full third term” is, seem insubstantial compared to an issue with the moral force of slavery, or the horror of impending civil war. Even leading cabinet ministers these days would be lucky to attract a crowd in three figures for a major speech without the bused-in presence of party activists. 30,000 people turned up to listen to Lincoln, without the aid of a microphone, give his first inaugural. Yet the over-riding message of this book for me, is that politics matters, politics changes things. And I think if we look hard enough, there are plenty of issues out there which we should feel as passionately about as the abolitionists felt about slavery. Domestically, literacy rates amongst kids leaving school, and amongst prisoners being released from prison, are shockingly high. Social mobility is going backwards under this government. Despite record spending increases on healthcare, hundreds of thousands of people are on waiting lists. Hard work and personal responsibility are being increasingly punished by our tax system. Internationally, human rights abuses in Darfur and Burma, global trade rules which penalise poor countries who seek to compete with the West, and of course, the rise of Islamic fundamentalism are all issues that Conservatives are, and should be passionate about. In Lincoln’s day, the abolitionists’ passionate belief in their cause, allied to skilful political leadership won the day. It’s always a potent combination in politics, and one that all of us on the Right must seek to emulate over the next few years. Graeme Brown was the Conservative Candidate for Ashton-under-Lyne in last year's General Election. Didn't Lincoln believe that the blacks should be sent back to Africa? Furthermore his support for tarrifs had a detrimental effect on the unity of the country. A superb book. It explains quite clearly how the ACW developed (some lessons for both europhobes and europhiles and their excessive language perhaps) and how Abe rose to power from a limited base (it seems that the starting favourite is most likely to lose due to existing emnity more than lack of policy). One interesting detail is Abe's ability to avoid policy statements, when these would become divisive. I am not even going to think about matching Dave with Abe but Dave's reticence makes much more political sense now. Overall a really worthwhile read, especially if your flight is cancelled and you have to take Eurostar to get home in time for work on Monday. PS While I agree with Richard that US Whig or Republican support for tarrifs clearly goes against what we believe now, at the time it would have seemed a pretty obvious choice when you have a surging internal market. The opposition from the Democrats, of the time, also makes sense when their supporters were exporting tradable commodities. PPS While there was a element amongst abolishment supporters for encouraging ex-slaves to move back to their "homeland", I believe that it was recognised by most people (on either side) that this was a flight of fancy that ticked some of the boxes of some voters without ever being a realistic proposition. Rather like most of New Labour statement I suppose.